Please visit the Employment tab on our website to view our open positions! This entry was posted in Uncategorized on November 25, 2014 by Jodi Mackay. Happy Thanksgiving week! We are so thankful for you! Here are our specials for this week: SOUP: Monday-Pumpkin Bisque Tuesday-Rice Florentine Wednesday-Steve's Vegetable SALAD: Teriyaki Chicken SANDWICH: Turkey Club Wrap We will be closed on Thursday and Friday for the Thanksgiving holiday. This entry was posted in Uncategorized on November 24, 2014 by Jodi Mackay. 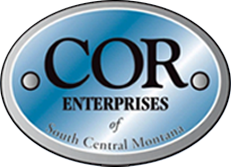 COR Enterprises hosted a memorial service for Nickie Rafter today. It was amazing to see Nickie's family and friends gather together to celebrate her life and to say "so long" to such a sweet soul. 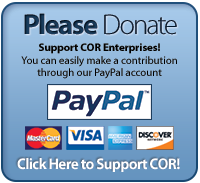 Nickie's kind and gentle presence will be missed at COR Enterprises. The picture below is of Nickie and her longtime companion, Teddy. This entry was posted in Uncategorized on November 19, 2014 by Jodi Mackay. Our dear friend, Nickie Rafter, passed away on Friday, November 14th. It is very hard to say goodbye to such a dear, sweet person. Our hearts are heavy with this loss. Please keep Nickie's family and friends in your thoughts and prayers. You can view her obituary here. This entry was posted in Uncategorized on November 17, 2014 by Jodi Mackay. The COR Coffee Shop and Deli is open! Good Morning and Good News ... The COR Coffee Shop and Deli is up and running today! Due to overwhelming popular demand, today's soup will be French Onion. We will feature Loaded Potato tomorrow (Friday). We have Roast Beef Dip sandwiches with caramelized onions and melty cheese, American Classic pepperoni pizzas and supreme calzones. Please stop by ... your support keeps us warm! This entry was posted in Uncategorized on November 13, 2014 by Jodi Mackay. The COR Coffee Shop and Deli is closed today due to frozen pipes. Please check in with us tomorrow. We hope to have a permanent solution in place today. Thank you so much for your continued support and patience! This entry was posted in Uncategorized on November 12, 2014 by Jodi Mackay. This entry was posted in Uncategorized on November 10, 2014 by Jodi Mackay. This entry was posted in Uncategorized on November 4, 2014 by Jodi Mackay.